I used to have a fabulous memory, seldom made any kind of lists except detailed shopping lists. That was back in the day when I used recipes and shopped once a week for rigorously planned-out dinners. That was a long time ago. Now, I make all sorts of general lists, I probably have twenty-five on my iPhone, but they're more suggestions than firm directions. 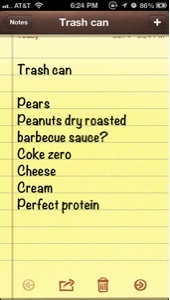 I walk around Costco consulting the lists on my phone. (I notice I'm not the only person doing this, and lots of them are much younger than I am.) But I'm always ready for inspiration. Being ready to buy things not on the list has worked for me, although I know it's against some financial planners' advice. Do you make lists? How detailed? Do they work? I really like your blog. I have started to make them on my way home from work or the gym. I only put about 4-6 items that I must complete before bedtime. It really helps to motivate me. They haven't quite seeped into my shopping area just yet.